Netflix’s original comedy series, Grace and Frankie reveals how two unlikely friends are brought together through unconventional circumstances. The story begins when Grace (Jane Fonda) and Frankie (Lily Tomlin) find out their husbands, Robert (Martin Sheen) and Sol (Sam Waterston) have been romantically involved with each other for the past 20 years. When the two women realise their marriages of 40 years are over, they reluctantly decide to move in together despite the fact they can barely tolerate each other. Grace is a sophisticated, uptight, retired entrepreneur, while Frankie is a free-spirited hippie art teacher. Grace and Frankie humorously follow two confident and independent women who courageously face a new chapter in their lives. Jane Fonda is quoted in Vogue saying, “I thought this was a show that could potentially give a lot of hope to people, especially to older people, especially to women. And I think that’s actually happened”. BBC America’s five-season sci-fi thriller, Orphan Black, follows an orphan named Sarah (Tatiana Maslany), a streetwise con artist who finds herself in the middle of a dangerous cloning conspiracy. Sarah’s life suddenly changes after she witnesses a woman committing suicide, only to find that this stranger looks identical to her. Sarah instantly capitalises on the opportunity to start a new life by stealing the victim’s identity, money and her boyfriend. However, Sarah’s life becomes more complicated when she discovers the dead woman was a police officer. As this intriguing story unwinds, Sarah is shocked to discover there are multiple genetically engineered clones of herself, and that someone is trying to kill them. Orphan Black is the story about a strong-willed young woman trying to survive and uncover the truth of who the killer is and why the clones were created. 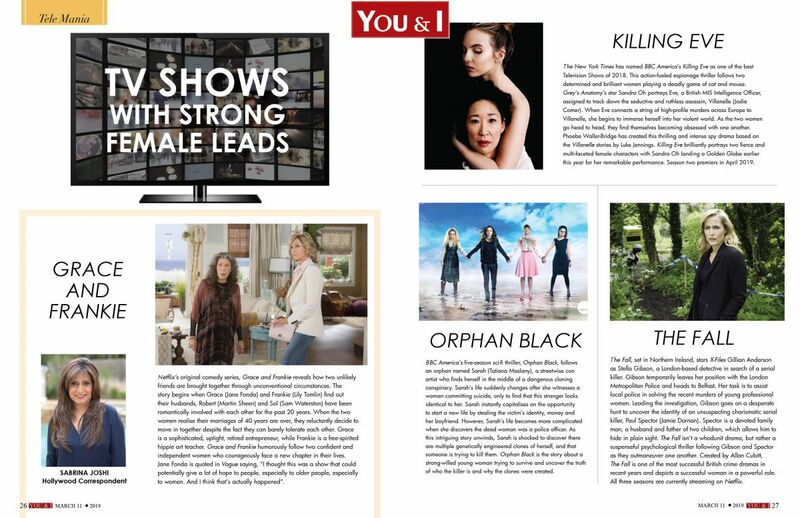 The New York Times has named BBC America’s Killing Eve as one of the best Television Shows of 2018. This action-fueled espionage thriller follows two determined and brilliant women playing a deadly game of cat and mouse. Grey’s Anatomy’s star Sandra Oh portrays Eve, a British MI5 Intelligence Officer, assigned to track down the seductive and ruthless assassin, Villanelle (Jodie Comer). When Eve connects a string of high-profile murders across Europe to Villanelle, she begins to immerse herself into her violent world. As the two women go head to head, they find themselves becoming obsessed with one another. Phoebe Waller-Bridge has created this thrilling and intense spy drama based on the Villanelle stories by Luke Jennings. Killing Eve brilliantly portrays two fierce and multi-faceted female characters with Sandra Oh landing a Golden Globe earlier this year for her remarkable performance. Season two premiers in April 2019. 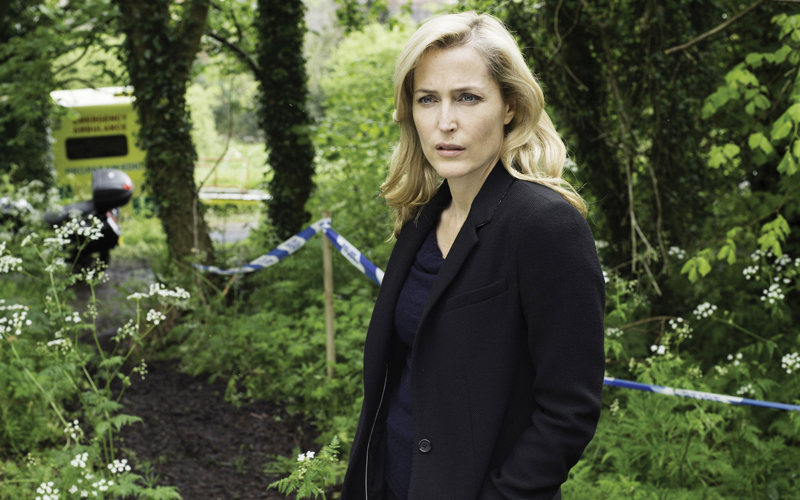 The Fall, set in Northern Ireland, stars X-Files Gillian Anderson as Stella Gibson, a London-based detective in search of a serial killer. Gibson temporarily leaves her position with the London Metropolitan Police and heads to Belfast. Her task is to assist local police in solving the recent murders of young professional women. Leading the investigation, Gibson goes on a desperate hunt to uncover the identity of an unsuspecting charismatic serial killer, Paul Spector (Jamie Dornan). Spector is a devoted family man, a husband and father of two children, which allows him to hide in plain sight. The Fall isn’t a whodunit drama, but rather a suspenseful psychological thriller following Gibson and Spector as they outmaneuver one another. Created by Allan Cubitt, The Fall is one of the most successful British crime dramas in recent years and depicts a successful woman in a powerful role. All three seasons are currently streaming on Netflix.